Thanks to the 1992 Package Travel Regulations, if you have suffered from illness as a result of poor accommodation standards, you may be entitled to claim compensation directly from your tour operator in the UK. If you have been affected by holiday illness then contact Simpson Millar’s holiday lawyers to see if you can make a claim. Bulgaria is becoming an increasingly popular holiday destination for UK based holidaymakers and it is well documented that tour operators are looking to cut their operating costs. We hope that does not result in a decline in holiday or hotel standards. Holiday illness can be caused by a lack of food hygiene standards, a lack of hotel sanitisation and by poorly maintained facilities (such as swimming pool and spa facilities). The resort of Obzor is set against a backdrop of the Stara Planina Mountains with the resort of Byala located approximately 5km away. The resort of Elenite is located on the Southern coast of the Black Sea, approximately 12km North of Sunny Beach. Cryptosporidium Fact: Cryptosporidium is an intestinal parasite. When the parasite is contracted it can cause the host to suffer from stomach cramps, watery diarrhoea, nausea, fever and dehydration. The parasite is spread by exposure to contaminated water and by poor hygiene. Bulgarian Holiday Ruined by Illness? – Let a Dedicated Holiday Law Specialist help. Simpson Millar’s holiday lawyers have a reputation for recovering compensation for holidaymakers that have suffered from illness and are experts in pursuing claims against tour operators such as Balkan Holidays, Thomas Cook, Direct Holidays, Airtours. Thomson Holdiays and First Choice Holidays. For expert advice of food poisoning and holiday illness, contact the experts by using the online enquiry form or by calling 0808 145 1353. 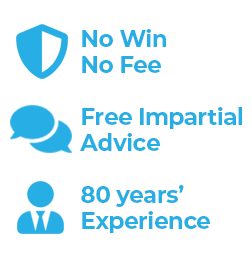 We can provide free advice and let you know whether you are entitled to make a ‘no win no fee’ claim.